I haven’t received an oil royalties check in 7 years! And my relative(B.T.) has been dead for even longer than that…& I am beneficiary to his mineral rights! But this company is trying to convince me that after all these years…that the $400 check they sent me in the mail is all I’m entitled to for BOTH ACCOUNTS!! And I just don’t think that was the rightful amount! Opinions,please!!! K.D. Simply impossible to say without more information. You may only be due a tiny percentage of the production. I have seen royalty checks that were less than a $1.00 per month. It may also be that the well(s) that you are in don’t produce very much. Somewhere in your records you should have something called a Division Order, which should spell out exactly what you are due. I received a check for only $464,after 8-9 yrs of not getting one. That paper shows that over $630 was transferred into my name,& that didn’t include my personal shares. In your opinion,shouldn’t I have received at least the $630?! The check stub indicates that 5 checks were issued in 2012 and 2013. The royalty revenues from November 2013 to December 2018 are the remaining $464. 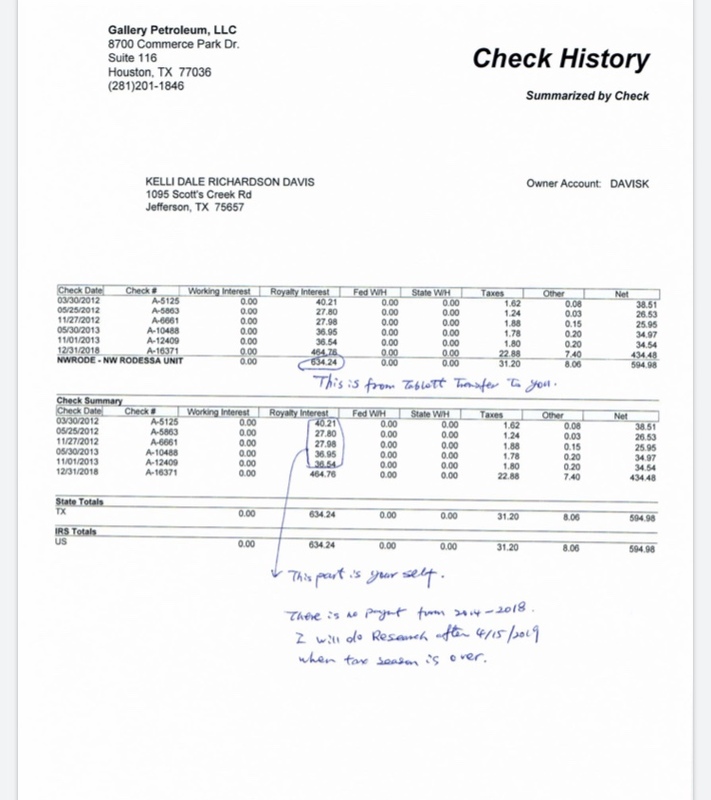 The note may mean that the accounting department needs to determine if the 5 checks were cashed by the executor or someone else. If you consider that may $36 is due every 6 months from November 2013 to December 2018, then that would be 10 payments totaling $360. The problem is that these are net royalty numbers and do not show the gross revenues and the royalty decimal. You should have a division order, well name and RRC lease number. Ask for the detail information on well volumes and sales and your net share each month to get to the total. I completely understand,& agree with you. The only thing is…I have never once…EVER…received a check from this company before! Not until the check for $464 came last week! Every check I have ever gotten (which was many years ago),were from Brooks Petroleum. The production data shows that 2013 to present day have been better than any previous years! These people have been giving me the runaround since last December,& have sent me four different statements…none of which show the same information! My attorney thinks they’re nuts! These four statements aren’t even CLOSE to looking like similar data! Each time I receive something from them,it’s different information from the same dates! Almost as if it was just made up on the spot! Weird!! !